A rotating scum pipe system typically extends the entire width of a basin. It is typically located at the far end of the basin, with flow towards the scum pipe, and supported at each end with an end bearing assembly anchored to the wall. The scum pipe typically has 60 degree slots along its length. In as much as the scum pipe is a weir application (i.e. ‘over-weir’), it is critical that the system be installed level. Additionally, it is critical the scum pipe is level – or near level – along its entire length. Deflection must be controlled. Maximum deflection tolerance should not exceed ¼” in order for the system to perform as intended. If too much deflection should occur then skimming would occur only in a confined area, and not along its full length as is desired. Additionally, once skimmed and in the pipe, the scum would need to travel up hill, if you will, to proceed to the end of the pipe. 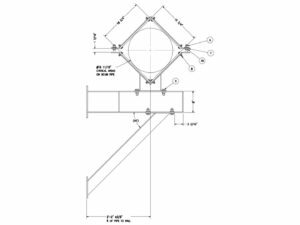 When the length of a scum pipe system drives the need to address deflection, an intermediate support is often the lowest cost and most practical solution. Other options typically involve significantly greater cost. An intermediate support consists of a wall mount bracket with an assembly that prevents vertical or lateral travel by the scum pipe when under its various load conditions. It includes a bearing surface, usually UHMW, to allow the pipe to rotate freely. In municipal applications, where basin widths are typically 20’ or less, and where stainless steel scum pipes with ¼” wall thickness are by far most common, no intermediate support is needed.